Mark Bradley has long been drawn to the needs existing in our urban areas. Twenty years ago, with an M.Div. in hand, Mark and his wife left Nova Scotia and moved to Chicago to further his education in urban ministry. Northern students over the past 100 years have traveled from around the globe and been brought to Northern. From its beginning, Northern was a lighthouse, and travelers from every corner of God’s earth made their way to Northern to follow God’s call on their life. 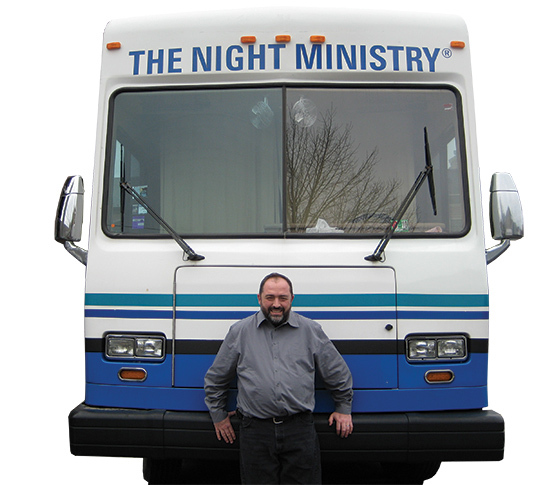 Today, Mark is Director of Outreach & Health Ministry at The Night Ministry in Chicago, which exists to serve adults and youth who spend the majority of their time on the streets. They operate a Health Outreach Bus, staffed with nurse practitioners, ministers and volunteers. Through Northern’s transformative and missionally minded programs, students are going forth into the world to bring Christ and His love to a world in desperate need. Thanks to alumni like Mark Bradley for carrying the Northern tradition into the next 100 years.